Since announcing he would be leaving the Royal New Zealand Ballet as its artistic director in November 2016, it became evident that Romeo & Juliet, the new ballet that had its world première in Wellington tonight, would be Francesco Ventriglia’s love letter to the company. It takes all the talent that the company (and Orchestra Wellington) can muster, dials it up a notch, and Ventriglia injects his own artistry and connections to make this not only a wonderful, classical reinvention of the Shakespearean tragedy, but one that is visually and dramatically authentic. It wasn’t a simple matter of staging and choreography: Ventriglia worked with dramaturge Mattia Mario Giorgetti to get the historical and social context of fifteenth-century Verona right; and Academy Award winner James Acheson (Dangerous Liaisons, The Last Emperor, and Restoration) was asked to re-create an authentic Verona with colourful costumes that, in Ventriglia’s words, ‘are as true as possible to the Renaissance as ballet costumes, created in the 21st century, can be’. Jon Buswell (lighting designer), Gillian Whittingham (choreographic assistant), and Frédéric Jahn (guest ballet master) were part of the ‘dream team’, but special mention must be given to fight coordinator Carrie Thiel, whose knowledge of stunt work and swordplay gave Romeo & Juliet an extra edge. 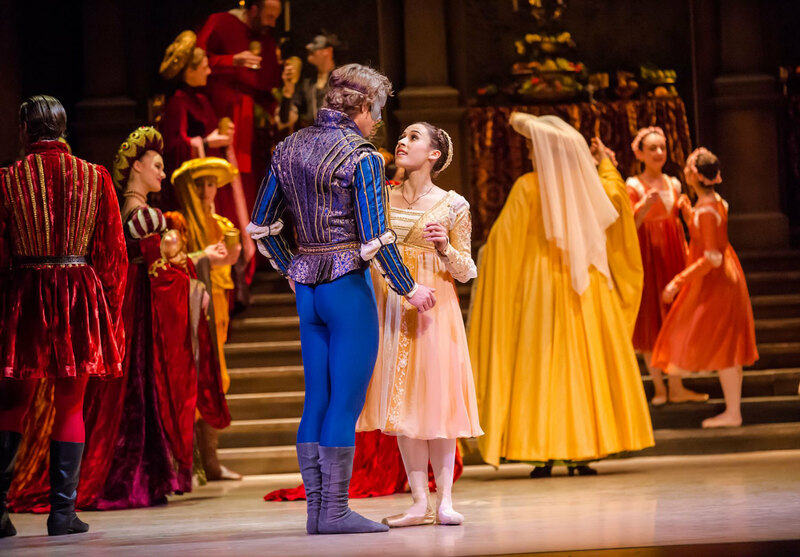 There were 13 scene changes and over 90 costumes: Romeo & Juliet was not just the RNZB’s biggest production of 2017, it could well be its grandest over the last several years. It fills its three hours (three acts, two intermissions) with extravagance; lovers of classical ballets will indulge in it. Acheson’s work was immediately evident with a bright, summertime Verona set that had more depth and detail than many other productions’; his sets also rotated and moved, easing the audience into each different scene. There was a beauty to these sets as well as a modularity, something that hadn’t been attempted successfully in previous ballets we’ve reviewed. Renaissance-inspired art featured in Juliet’s bedroom and in the church. Acheson is on top of his game, and the costumes and sets lent Romeo & Juliet a world-class flair. Opening night saw Joseph Skelton as Romeo and Madeleine Graham as Juliet, a well cast pair: both had caught our eyes in previous ballets. Skelton had an innocent quality as a young man falling in love; Graham gave her Juliet a mix of a childish wonder and determination. Let’s hear it for the boys: Massimo Margaria was on form as Romeo’s friend Mercutio, and his easy Italian charm almost stole the show; while Paul Mathews had a chance to showcase his villainy in Tybalt. While ‘villainy’ might be a strong word in some cases (but Sergei Prokofiev’s ‘Dance of the Knights’ certainly conveyed that in a masked ball scene taking place within the Capulet’s palazzo), it seemed to work here: the swordplay mentioned earlier took audiences from classical ballet to a fight scene in the first act that had the spectacle of Errol Flynn’s 1938 outing as Robin Hood; Ventriglia offered concessions to modernity by "freeze-framing" part of the action while allowing the central characters to continue, with Buswell’s lighting playing along, before gradually speeding it up again—something, we might add, that can only be accomplished with decent ballet dancers. Nevertheless, this isn’t a simple tale of good versus evil, but a love story. The pas de deux between Romeo and Juliet at the end of Act I was touching and tender, beginning with Juliet and her nurse preparing for bed in an upstairs room (another clever touch from Acheston), and Romeo performing some remarkable lifts once Juliet joined him. The always welcome Sir Jon Trimmer played Friar Laurence, and the church set was another triumph for Acheson with its simplicity and its crucifix (after Giotto) at its centre. Juliet’s solos were particularly moving: Graham’s performances in Act III were particular memorable, if tinged with sadness, when Romeo departs her bedroom after their secret wedding night; her contemplation of whether to take the Friar’s potion; and her despair on discovering that he had taken his life after thinking she had taken hers. Ventriglia gives a glimpse of the lovers gazing at each other before the final curtain, leaving the ballet on a more positive note, signalling that they are together in the afterlife. Some members of the opening night audience offered ovations to the cast and to Ventriglia, Acheson, Giorgetti and others. As a ballet that began life in October 2016 while Ventriglia was artistic director, it was a fitting valedictory work. Twenty-two performances have been scheduled from the première on August 16 till September 24, in Wellington (with Orchestra Wellington), Christchurch (with the Christchurch Symphony Orchestra), Auckland (with the Auckland Philharmonia Orchestra), Rotorua, Dunedin (with the Dunedin Symphony Orchestra), Invercargill, Palmerston North, and Napier.